The sun was high and bright when we finished Kepler Track. We drove directly to the DoC office in Te Anau hoping to get our Milford Track tickets. What awaited us was not great news. There was a large rainstorm cloud moving up from Antarctica. We’d likely be stuck in one of the huts for an extra night due to flood risks. The news dampened our spirits and my body ached from hustling through the last day of Kepler. We checked into our hotel– a hot shower and a hot dinner helped to clear our heads a little. We decided to check in with the DoC office again in the morning to see if there had been any changes in forecast. In the morning, we woke up to another sunny day. I was optimistic— the clouds on the horizon didn’t look like they’d bring rainstorms. But when we drove to the DoC office for another check in we saw the satellite images of the forecast, which clearly showed a storm waiting on the southern border of the South Island. We had to change plans. After talking to the officers regarding our options, we decided to drive south that day for a gentle day hike on the Hump Ridge Track. It was a two hour drive to the trailhead, which was located next to barbed wire fenced cow farms. The sign said the trail was maintained by the community and a five dollar fee was collected on voluntary basis in a box at the parking lot. We learned from the DoC office that the full trail is a 60 some km loop with ocean views and two huts along the way. And the huts cost only $15/night! We would’ve happily done this trek, had the weather permitted. We strolled on the beach for a couple hours, found a decaying seal, abalone and mussel shells, and some beautiful plants. We learned about Dunedin (pronounced Dun-E-din) from fellow hikers on Kepler Track. They described a coastal college town with street artist graffiti on the walls of giant warehouses. The image of Valparaiso, a coastal town in central Chile which we visited during our honeymoon, came to our minds. Plus we were more likely to escape the rain on the other side of the island. We decided to make the long drive to the east coast. The drive from Te Anau was almost four hours long, and we emerged from low hanging rain clouds to find a clear sky and bright sun in Dunedin in the early afternoon. We checked into our AirBnB near the center of the city, chatted with the host for a while and picked up some interesting local travel tips. Tricia and I decided to visit Mount Cargill and Organ Pipe Rocks. It was a 20 minutes drive up Mount Cargill. The wind at the lookout rivaled that of Kepler Track, and the view of the Otago Peninsula was also spectacular– a strip of land with palisading cliffs protruded into a blue water bay where the water surface glistened in the bright sun. Since our attempt to hike down from the lookout point to the Organ Pipe Rocks ended on a cliff, we went back to the original trail and followed it north. The trail was narrow and was sheltered on both sides by 8 to 10 foot tall shrubs. We passed the Butter Peak which provided us no clue how much further it was to Organ Pipe Rocks. So we hiked blindly for about 20 minutes when our view opened up to a pile of rocks. These polygonal columns reminded me of the Causeway in Ireland on a much smaller scale. The next morning, we decided to explore Dunedin and the Otago Peninsula. Dunedin is a small city, and the city center, called The Octagon, has lots of restaurants and shops. We had lunch in one of the restaurants, but the food was mediocre and price was inflated. I was more excited about our afternoon trip to the Otago Peninsula. The drove out was a single lane road, which was built immediately adjacent to the water with no guardrails. The speed limit was set at 80 km/hr for the most part. Tricia drove us into the peninsula. I could tell her knuckles turned white from clutching the wheel so hard the whole way. We went to Allans Beach first where we found a large sea lion passed out on an open beach. The wind was strong so visitors were sparse. We drove up the bluff on the southside of Papanui inlet and watched Victoria Beach and Wickliff Bay from across the strait. We kept moving from there, following Papanui inlet road to park our car at Okia Flat. It was short hike to the Pyramid– a Chocolate Hill like mound– which demarcated the edge of a marshland. We learned from the plaques along the trail that Maoris used to trap eels in this marshland, and penguins and sea lions come to rest in the marshland at night. 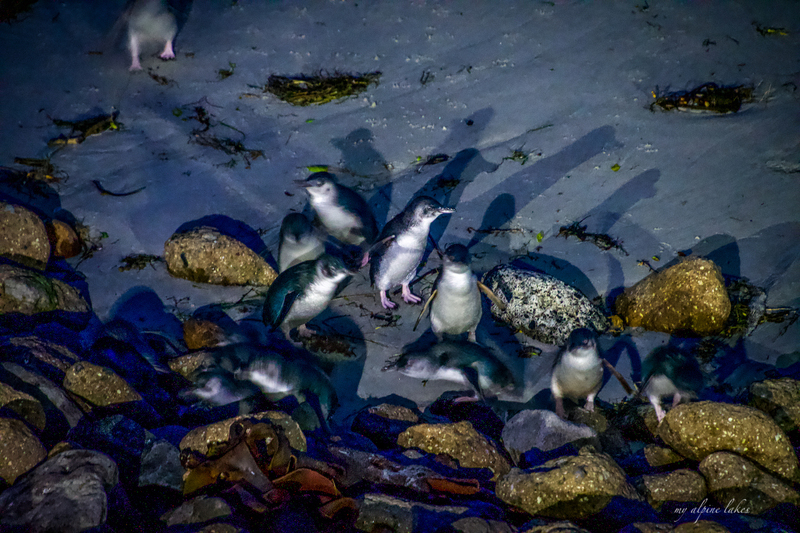 We didn’t linger too long on Victoria Beach since we had something else planned for the evening– watching Blue Penguins return to their nests after a day of preying in the sea. We drove to Portobello, the only town that we found food on the peninsula, and bought fish n chips from Ric’s Galley. We ate our dinner on a bench in front of Latham Bay while Red-billed seagulls surrounded us looking for scraps. It was another 20 mins drive after dinner to Royal Albatross Center, which was built at the northern tip of the peninsula. The tour started after sunset. The staff at the research center led the group of enthusiastic tourists down a staircase to the waterfront. A sea lion was napping on rocks, perhaps waiting for the Blue Penguins to return for the night. 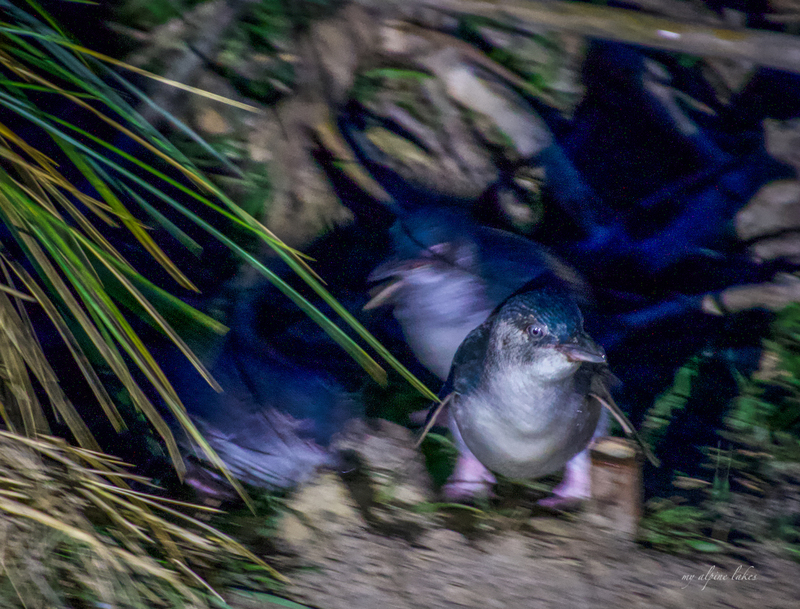 Blue Penguins are the smallest penguins species and go out to the sea to hunt individually but return in packs for protection. They are prey for sharks, whales, sea lions and a number of other predators. Everyone turned their their eyes to the beach. I focused my eyes on the beach too, but I didn’t see anything at first, except few gulls strolling listlessly at the water edge. “They are on the left.” The voice yelled again. Everyone turned their faces to the left side of the beach. 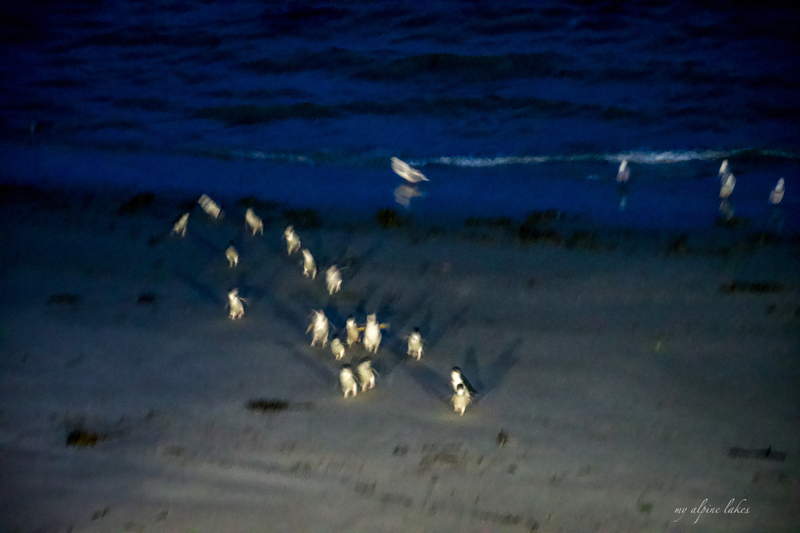 I saw a few white bellies emerging from the crashing waves, waddling onto the beach. They seemed unsteady on their feet, like a bunch toddlers accidentally got into their parents liquor collection. I was worried that they’d fall on their faces. The raft (Blue Penguins form packs, which is called a raft, on their return journey) had about 15 members. The staff explained that the same members usually stay in one raft each evening. It meant these creatures make friends and keep them for a lifetime! The penguins waddled through the beach, wiggled their way over rocks, and ambled up a sandy hill before disappeared into the tall vegetations of the marsh. Under the ground lights, their backs appeared black. But when I captured them on my camera, their feather had a dark blue hue. More rafts of penguins followed. Most rafts had between 10 to 20 penguins, except one that had 30 penguins! Over the next hour, over 140 penguins came to shore and disappeared into the marsh. We were thrilled! I was clicking away with my camera, knowing that many photos would turn out blurry since these little guys were constantly moving and twitching. Our objective for our last day in the South Island was to make it back to Queenstown. Tricia went for a run in the morning, while I slept in. We planned to leave by 10 am but Tricia mis-calculated the time and got out of bed by 7 am instead of 8 am. Silly. We were on the road by 9 am. We planned to take the north route through 85. My GPS got weird when we left Dunedin, and we ended up on route 1 and 8 heading towards Alexandra in Central Otago. Central Otago has an interesting history. The fourth largest gold rush of the world took place here in the middle of 1800. It made Dunedin the largest city of New Zealand for a brief period of time, and it contributed greatly to the wealth accumulation and population boom of this young nation. In the last quarter of 19th century, Central Otago embraced their first wave of Cantonese settlers who came late into the game to look for gold. They endured harsh living conditions and social prejudices in this foreign country. Some of their primitive shelters were maintained as outdoor exhibits at Goldfield Mine Center. Since we were driving through Alexandra and Cromwell, it felt right to tour the old gold mine. Our tour guide was an older gentlemen who turned on these monstrous looking stone crushing machines powered by water to show us how it was done back in the day. He also had this dog, who had made it a mission to race the column of water coming out of a water cannon every time it was turned on. Here’s a video of the water loving dog. Of course, we tried our hands on panning gold. It was labor intensive work under a blazing sun. The idea was simple: shaking a water filled pan of dirty can allow gold, which is heavier than dirt and rocks, to settle to the bottom of the pan. As you peel off the layers on to the top, gold flakes remained on the bottom can be revealed. Unfortunately, we panned for an hour and found no luck that day. On our second arrival to Queenstown, we already knew what we want to eat. We found a place called Pedro’s House of Lamb on Yelp, and it served one dish only– a roasted leg of lamb. We went to the grocery store and bought some greens to go with the roasted leg of lamb. Washing down the food with a half bottle of unfinished wine from Dunedin, we devoured the lamb on the back porch of our Airbnb. It felt like the right closure to our South Island adventure. What do you think about out adventure around Dunedin? Anything else you’d like to suggest for my fellow readers? In my next post, we take an exciting adventure underground in the Waitomo Caves where biofluorescent critters set up traps on the ceiling of the caves looking like stars in a night sky.